Buongiorno88, Rzym, Włochy : Rezerwuj teraz! Buongiorno88 is a beautiful guesthouse located in Rome. But Rome isn’t just a town ; it’s a open outdoor museum city showcasing food, art and street culture scenes different from any other city around the world . Staying relaxing days at Buongiorno88 would be the first step ; once a beautiful 19th century building, it’s a short walk from the Colosseum and Roma Termini station. 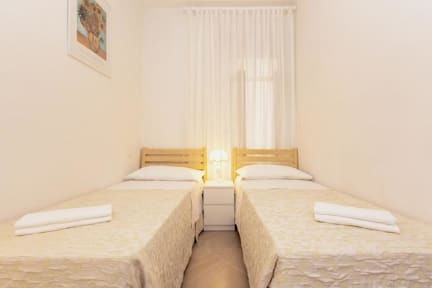 Buongiorno88 is located 3 blocks off the main Station Termini, just in front of Terminal Fiumicino main airport,10 minutes from all the main attractions, like the Colloseum, Piazza Venezia, TREVI Fountain, Spanish Steps and the Pantheon. The Vatican City is a little further down the road and you will have no problem as public transport is just under the house. For the night owls, we have a disco just a stones throw away, round the corner the main Basilica of Santa Maria Maggiore and if you want to forget your problems go and have a drink down at the many Irish pubs that are a stones throw away from the house. If you have problems sightseeing, we will try and get you infomation and tips for the day. All our bedrooms are quiet and comfortable, even for senior guests on a romantic trip in downtown Rome.Situated in the heart of the eternal city and stones throw from all the major monuments a nice warm reception in an sunny apartment of 4 rooms very well located between Termini station and the Colosseum. If you want peace and tranquility.